Who is ready to draft their own pattern piece!? Aww now don't panic! 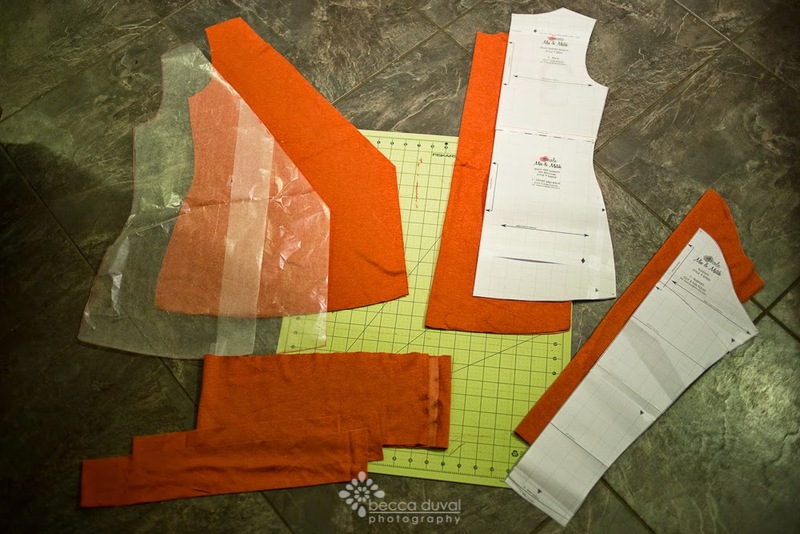 If this is your first time combining or modifying pattern pieces, you'll be thrilled to see just how simple it can be! Fabric & the usual notions. Tape two pieces of wax paper together, each the length of your basic bodice+tee pattern. You should be able to fit both halves of the pattern pieces across. Lay wax paper overtop the bodice+tee pattern, and trace from the shoulder, down around the side, and across the bottom. Flip bottom piece, complete the trace across the bottom. So far so good, right?? Images below show the wax paper under the paper pieces so you can better read them. Grab your crossover piece. 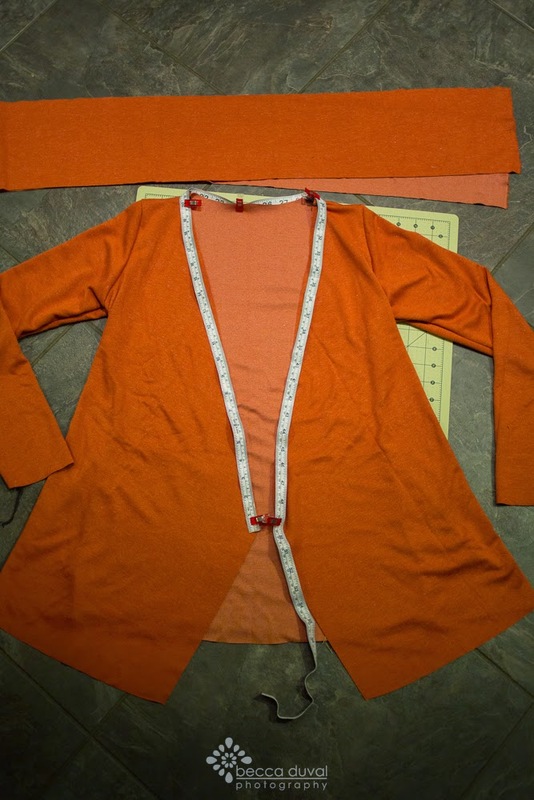 Match the inside shoulder seam and trace. We will improvise this line in a minute. Find and mark the narrowest part of the tee bottom. This is the waist. 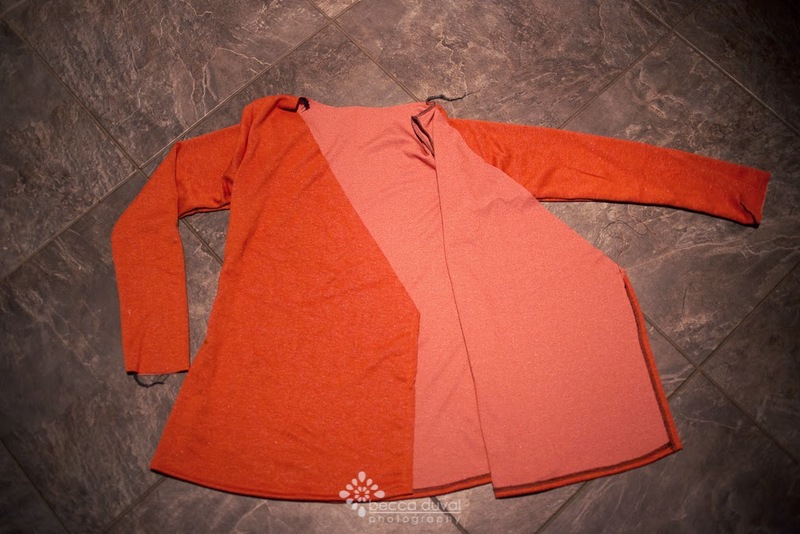 On the side opposite the shoulder seam, draw a line straight down from the waist to the hem. Now for our "improvising" step! Using your ruler, draw a line from the waist up to the crossover curve. 2 Front pattern pieces, one mirror. 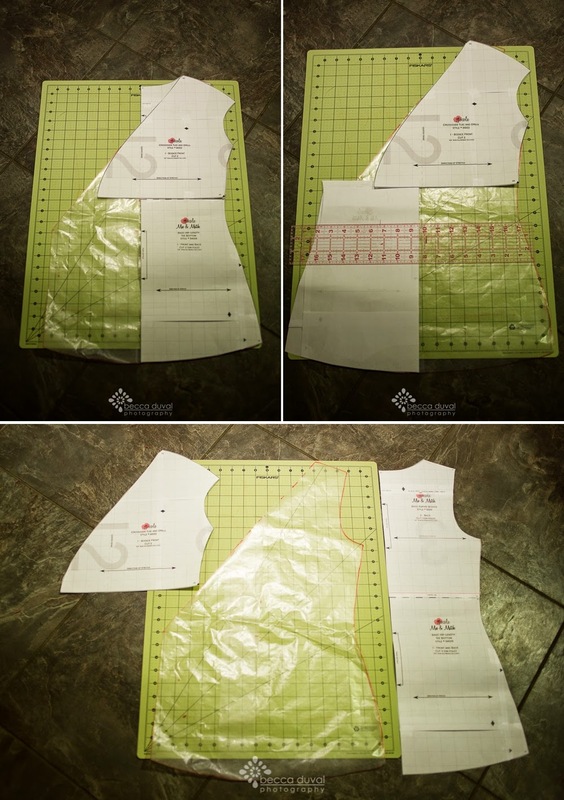 Refer to any of the jocole pattern tutorials for diagrams and additional details on assembling shoulders and sleeves. 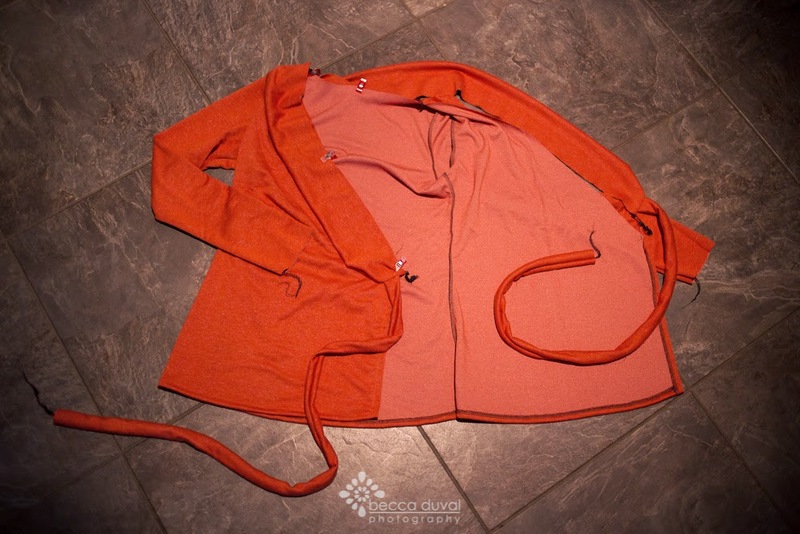 Now we need to hem the remaining sides and bottom, as shown above. You can fold 1/4 and 1/2, or be a cheat like me and serge the raw ends, then turn 1/2 inch and stitch. Now let's measure down our neck binding! Grab it, your measure tape, and your scissors. How long is the opening? Add 1 inch for seam allowances, and cut your binding to size. Have a bowl or other curved object around? Great! We'll need that. Or you can eyeball if you're feeling gutsy. Fold over the neck binding, then freehand a curve at the short ends. Start about 1.5 inch up from the long raw edges - we'll have to add our ties here. 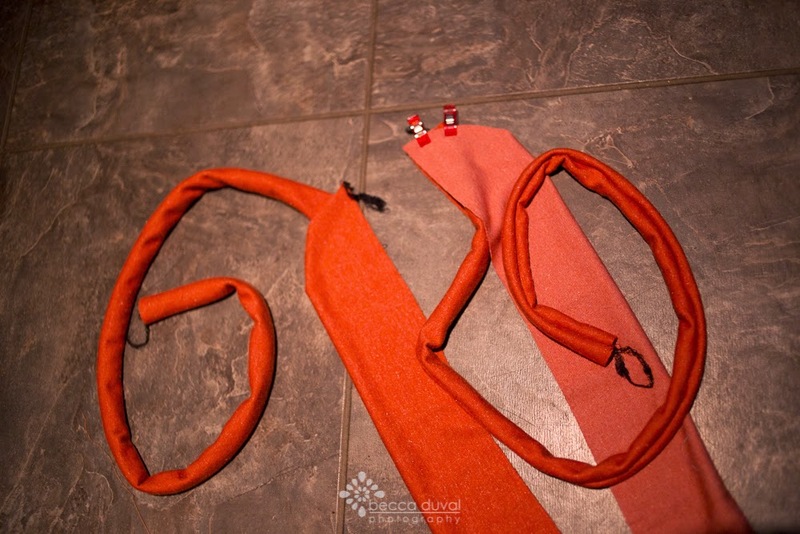 Sew each tie piece into little tubes (first RST, then turn). They'll be a little unmanageable this way, but we will topstitch in a bit! Do NOT sew the short ends, we'll cut those down to size later. Clip or pin the ties as shown, 1/2 inch up from the raw edge. Sew along the curve, back tacking at the ties for extra security. Stitch the neck binding RST across the opening. I knowwwww it looks ugly now, our top stitching will pretty it right up. Now let's try it on! We need to measure down those ties. There's no button hole to feed the ties through, but don't fret - this is a rather imperfect science. Your ties should wrap behind your bodies, around the side and tie in a loose, easy bow or knot at the front. What's left? Cut one of your ties at hip length. Now take off the sweater (that's already looking pretty schnazzy, might I add!) and cut the other tie to match. Fold the raw ends of the ties 1/2 inwards and pin. Time to top stitch! Start at the center of the neck band/back bodice seam. Fold the raw edge inwards, and top stitch all around to the tie. Put the needle down, lift the presser foot, turn. (Do this at all corners.) 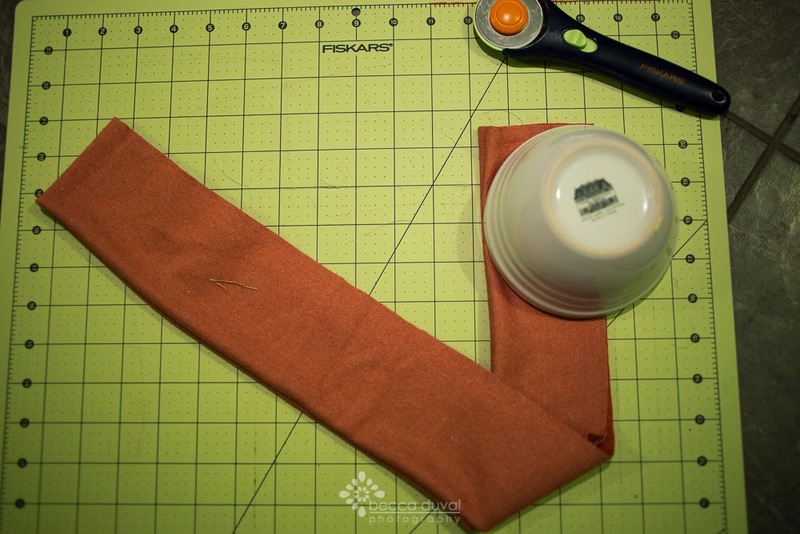 Sew down the tie, across the tucked raw edges, back up the tie, and alllllll the way around to the other side, down THAT tie, and that folded raw end, back up the neck band/ back bodice seam and meet at our starting point. You just made one heck of a top stitch circle my friend! Those finished ties need a place to feed through when wrapped. Let's add a button hole! Lay one front bodice piece down over top of the back bodice. Where the ties meet the side seam, mark a button hole the same size as the tie width. Take that puppy over to the machine and stitch your button hole! Now hem (or add a cuff) to your sleeve, and proudly parade around in your completed wrap sweater! Note on fabrics: The button hole - with certain machines, and certain light weight knits may prove problematic. 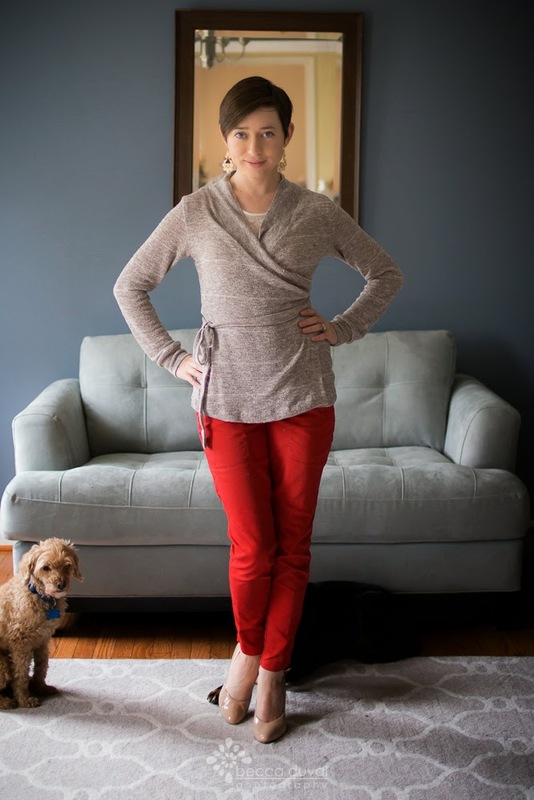 I've used medium weight sweater knits and heavier weight ponte de roma. If you use thinner knits consider sewing the ties to the side-seam at the waist, so they don't need a button hold on the inside to wrap fully around the body. There you have it! 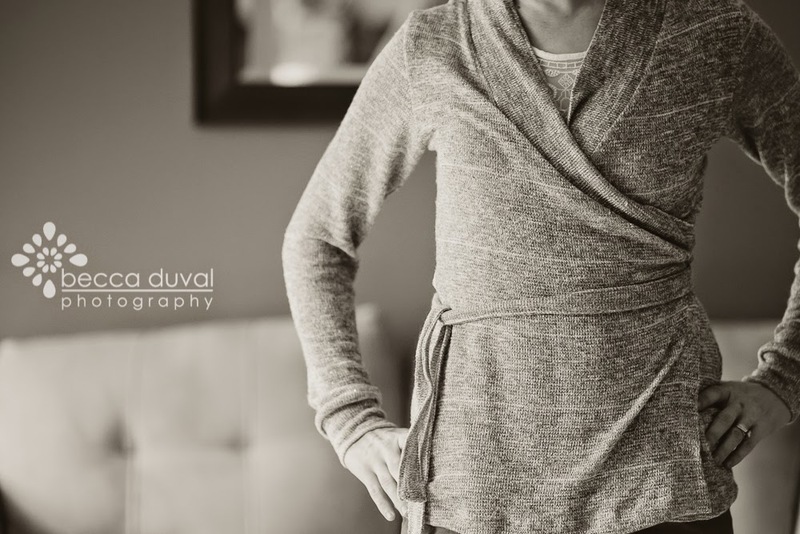 Your very own wrap sweater! Really - what *can't* we do with Jocole patterns? ?